Did you do the reading for the paper? Not yet, I’m studying Spanish. You have to do the reading. I know, but the Spanish quiz is on Monday, and the paper isn’t due for a month. Right, but you have to read about it before you can write about it. WHEN will you get to it? The Massacre paper doesn’t just happen, you know. I said I’ll do it. You can’t rush the Massacre! You need to devote time to it. Seriously, focus on the Massacre. I mean it. Concentrate on the Massacre. You’re making it pretty easy to do that, MOM. Want more happiness? And laughter? And a possible end to war and conflict everywhere? 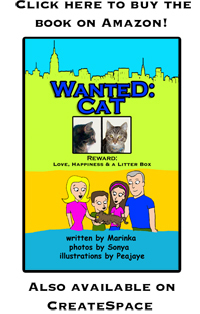 Check out Nicki’s website, Wanted Cat! From what I see, she will learn about management in the real adult life. Ahh, wanting to kill your parents because they are asking you too many simple questions. It takes me back. Awesome. We should all really focus a little more on The Massacre, amirite? I’d rather learn about a massacre than study spanish. I just want to live in your house. Conversations about massacres shoved down my throat , and all. I completly agree, the massacre comes first. Books can be read and reported on within one evening. I did it for years. Just don’t ask me any questions about anything I have read after the fact. And don’t invite me into your book club. I’m just there for the snacks. I don’t get it, the Massacre sounds like so much more fun than Spanish. My great-grandparents lived in Chicago in the 1920s, and my great-grandfather was a mechanic. No one can convince me he wasn’t an eye witness to the St. Valentine’s Day Massacre! So, if your daughter wants to interview me and ask me what I think my great-grandfather VERY LIKELY WITNESSED BECAUSE HE WAS THE ONLY MECHANIC IN THE ONE GARAGE IN CHICAGO IN THE 1920s, she’s more than welcome to do so.